On Sunday afternoon, I was due to go over and meet my business partner who lives in Florida, but was on a flying visit to the UK, staying at his parents house in Saughall. I set off a bit early to try and bag a few caches on the way as it’s ages since we’ve cached in the Chester area and quite a few new caches have come out since. My main aim was the Insy Winsy cache just south of Ellesmere Port as it’s been recommended to us by several friends. As I approached Chester on the A41, I was very close to Shroppie – Christleton, so I stopped for a nice quick find. I then carried on up the A41 round the side of Chester and stopped for another quick find at Backford Dipper on a towpath by a nice canal. Next, was a quick micro down a disused road and then on to Insy Winsy. I knew it was a sneaky one where you had to do *something* to get the cache out but had no idea what to look for. I was thinking the cache would be high for some reason and whilst checking this theory out, I literally came face to face with the cache, much lower than I thought! The log came out all too easily, but then the fun started as it was not the log at all – just a note telling you there was more work to do. I won’t say what I did to get the cache itself as it would spoil the fun for others, but rest assured, if you have not already done this cache, it’s great fun and something a little bit different. Just time for two quick other caches before my meeting so a nice cache and dash by a pub near Cheshire Oaks, followed by a dive into some lovely woods for another cache were in order. 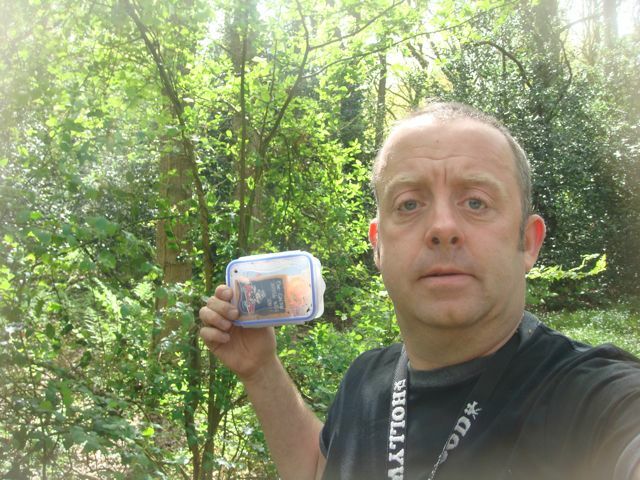 After my meeting, I set off to bag the two new caches in Saughall. I could not find the first one and spotted some DNF’s on it. A PAF confirmed what I was looking for and where it should be. It was nowhere to be seen to I marked it as a DNF and set off for the next one. I then had a lovely walk through some gorgeous bluebell filled woods to a cache called (appropriately enough) Bluebell Woods. I spotted Pieman had found this two days ago so wondered if he had managed to find the last one that I could not find. After eventually getting a data singal, I looked it up on my iPhone to see the cache was indeed missing but had been replaced yesterday. A quick walk back over the field and I found the cache, thus saving me having to log a DNF. I could not resist one final cache on the way home so returned to Stanney Woods for another cache by the people that had set Insy Winsy. This one has multiple cache containers hidden in the same area and your job is to find the one with the logbook in. A bit like our What The Heck ??? !!! cache but different. I actually found the correct one first time round but did not spot the logbook so carried on searching. After finding two more, I looked at the first one again and spotted the logbook – doh! I won’t spoil it for others but will add that there is a fun surprise when doing this cache – you’ll have to go and do the cache to find out what though ;-). I was getting hungry by now so headed off home with a very respectable 9 finds for my trip out.